Have you ever been on a flight that was delayed or cancelled? Have you ever been “bumped” or denied boarding on a flight? If so, you could be entitled to airline compensation. You know all that frustration and helplessness you feel when stranded at the airport? Turns out you’re not helpless at all. In fact, you have a lot more rights than you may realise. The amount of compensation varies depending on the type of disruption and the route disrupted. But nonetheless, it’s in your power to reclaim the compensation owed to you. Here’s how you can. At AirHelp we always recommend that you file a claim yourself directly with the airline, but if you don’t have time, or get rejected, we’re here to help. Passengers on EU flights that are eligible under EC 261 must be paid up to €600 in compensation for flight delays of more than three hours. Think of it as a financial silver lining for your air travel woes. 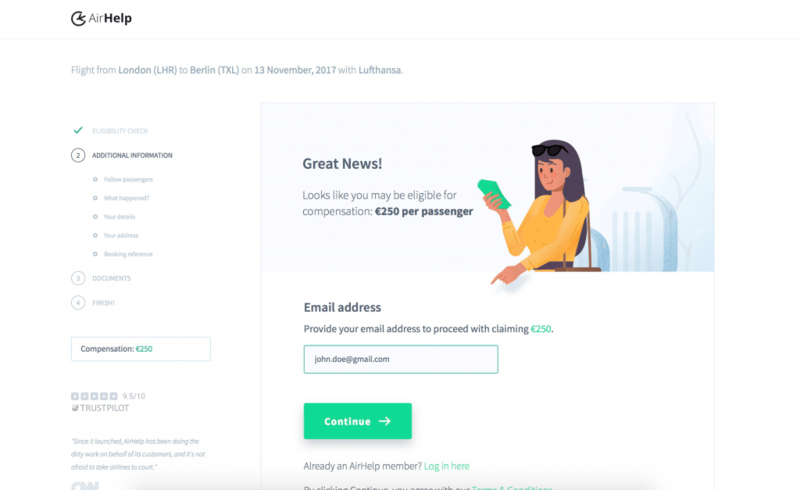 There’s a staggering EUR 7 billion in unclaimed compensation waiting for air passengers who’ve experienced travel trouble. We can help you claim what’s yours. Here’s what to do. Check your compensation. 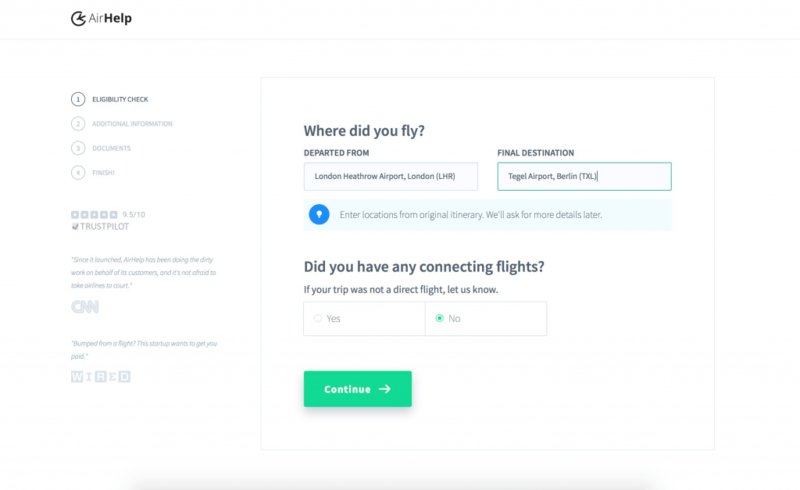 You submit your details and we run a quick flight check to see if the airline owes you money. 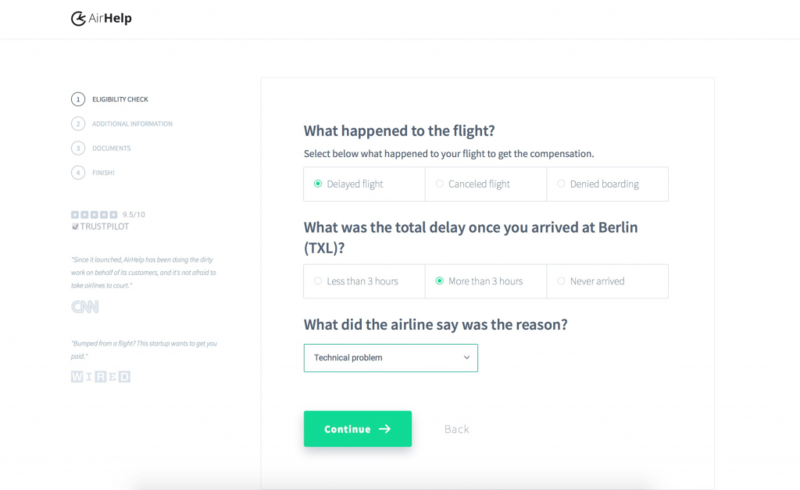 AirHelp manages your claim. We’re very good at this, so you sit back and relax while we jump into action. We send you the money! We get it to you as quickly as we can, with regular updates along the way. Step 2: What happened? And how long was the delay? It’s important to understand that you don’t have to be stuck at the airport right now to be eligible for compensation. If you’ve been on a disrupted flight in the past three years, the airline could owe you money. Unfortunately, that’s where the simplicity ends. If you’re flying to or from Europe, the law is defined by EC 261 and protects you from delayed, cancelled, and overbooked flights. The Code of Federal Regulations, Title 14, Aeronautics and Space, Part 250 spells out U.S. travelers’ rights. For flights within the U.S., the only passengers protected are those denied boarding who arrive at their destination over one hour late. If your flight is delayed or cancelled in the U.S., you’re not eligible for compensation unless you choose not to fly (in which case you should get a refund for your flight). However, you may be eligible for compensation if your flight to or from Europe is delayed or cancelled. If the airline notified you of the cancelation at least 14 days in advance. If you’ve been denied boarding in the U.S. and your new flight arrives one-two hours late, you may be eligible for 200% of your one-way fare (for a maximum of $650). If you’ve been denied boarding in the U.S. and your new flight arrives over two hours late, you may be eligible for 400% of your one-way fare (for a maximum of $1,300). If you’ve been denied boarding in Europe, you may be entitled to between €250 and €600 per passenger, as well as a full refund of your confirmed reservation. 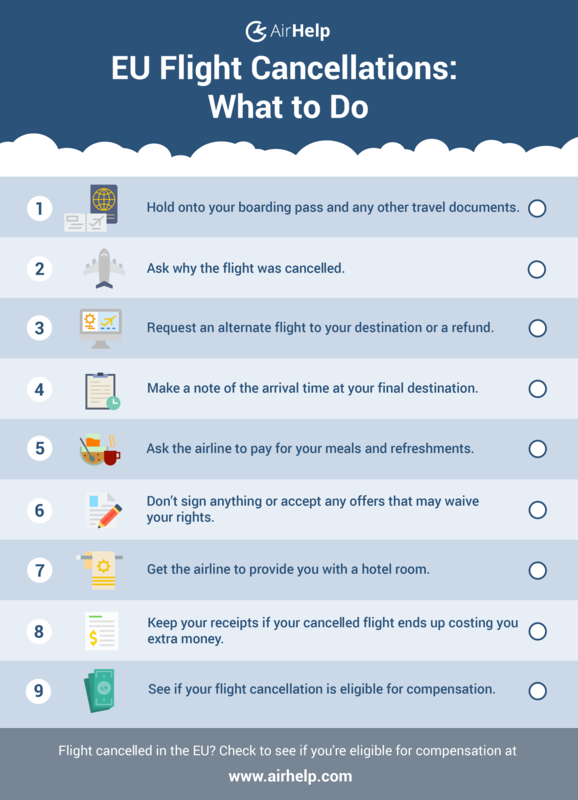 The first thing you should do when filing a claim for compensation for a delayed, cancelled, or overbooked flight is to contact your airline. You can do this by calling them, writing to them, or asking a gate agent for the best method to file a complaint. Keep in mind that the airline you booked with may not be the airline you flew with. If that’s the case, file the complaint with the airline you flew with. And make sure to include all the details listed above to avoid any unnecessary back and forth with the airline. The potential downside: there are no laws requiring the airlines to get back to you. It could take them months to get back… or they might not get back at all. Try this method first, but understand it may not be the last step you take. If the airline ignores or rejects your claim and you feel that you have a case, then the next step is to take your claim to the regulators. If you’re in the U.S., file a complaint with The Aviation Consumer Protection Division (ACPD). If you’re in Europe or the UK, file a complaint with CAA. These websites show phone numbers you can call and have online forms to fill out so you can choose whichever method you prefer. Keep in mind that the regulators are on the side of holding airlines accountable, but they are not law enforcement bodies. Therefore, this is not a guaranteed way to get your compensation. If the first two steps don’t work, then the final step is to take your case to small claims court. First review your passenger rights to ensure you have a strong case before you waste your time or money taking the airline to court. Even though you’re filing a claim in court, you don’t need a lawyer. Just be prepared with all the details mentioned above and make your case. The most likely cause of a lost case is if the airline proves that the disruption occurred because of an “extraordinary circumstance” beyond their control. Make sure the disruption that happened to you was one that could have been prevented. 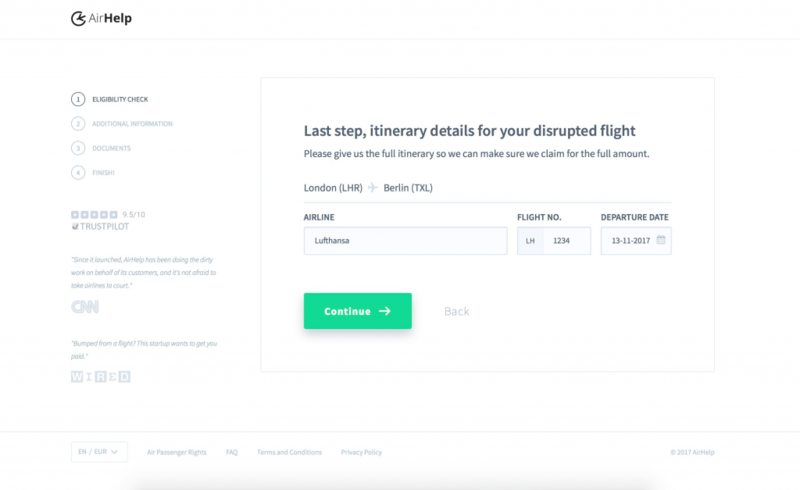 There’s no telling how long and arduous the steps for filing a claim could be – that will vary depending on the airline, the circumstances for the disruption, and the information you provide. If you want to file a claim without the hassle, file your claim through AirHelp! All you have to do is submit your claim, enter the details of your flight, and sit back and wait while we do the rest. (We’ll even take the airline to court if it comes to that). We only get paid if you do (25% of the claim if the claim is won). Flight delays happen, but that doesn’t mean you have to accept them. You may be entitled to as much as €600 in compensation if your flight was delayed, cancelled or overbooked within the last three years.